Understanding the Different Types of “Long-Term Care” | Hupy and Abraham, S.C.
Based on current trends, 60 percent of all Americans will need additional help or assistive services during their lifetime. For many older adults, this will take the form of long-term care (LTC). The need for LTC may only last for a few weeks, months or for years. But in all cases, clients deserve to be treated with dignity and respect at all times. 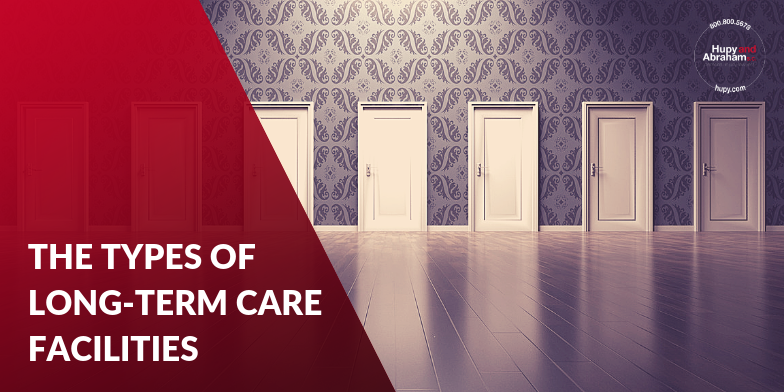 When making plans for future care or trying to decide what’s best for you or your loved ones, it is important to know the difference between the four primary types of LTC services. In doing so, it is also important to be aware that elder abuse or neglect can occur in institutional settings like nursing homes, as well as in other types of care settings. 1. Nursing Homes / Skilled Nursing Facilities: Provide general nursing care to those who are chronically ill or unable to take care of daily living needs by giving individualized personal health and medical care. 2. Assisted Living Facilities (ALFs): Provide residents with individualized personal care, assistance with daily living activities and services such as laundry and housekeeping. Like nursing homes, ALFs may also offer health and medical care, but residents typically require less care than nursing home residents. 3. In-Home Care Providers: Offer care in the home by licensed health care professionals who provide specific medical/nursing treatment needs or by professional caregivers who offer daily assistance to ensure all the client’s needs are met. 4. Adult Day Services: Provide care during the day at community-based centers. These structured, comprehensive programs offer social and support services during part of a day, but not 24-hour care. Adult day services are also utilized when a primary caregiver needs to take a break, to run errands or is unable to provide care themselves for a short period of time. An estimated five million older Americans suffer from abuse, neglect or exploitation each year. That is why it is important to understand that elder abuse or neglect can occur in any of these care settings. Due to the intimate, prolonged and often unsupervised contact that care providers have with vulnerable clients, abuse and neglect happen far more often than we realize and are rarely reported. Nearly all types of abuse and neglect found in nursing homes occur in assisted living facilities, adult day services centers and by in-home care providers/services. This may occur as physical, sexual or psychological abuse, as well as neglect in many forms. Visit our nursing home abuse and neglect blog to learn more about abuse and neglect specific to nursing homes and LTC facilities.